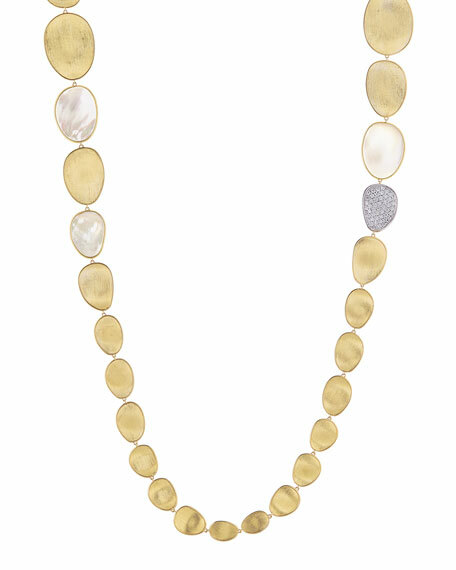 Marco Bicego Lunaria Long Mother-of-Pearl Station Necklace with Diamonds, 39"
Marco BicegoLunaria Long Mother-of-Pearl Station Necklace with Diamonds, 39"
Marco Bicego necklace from the Lunaria Collection. Single pavé diamond accent station. 2.25 total diamond carat weight. Armenta necklace from the Old World Collection. Signature oxidized sterling silver. 18-karat yellow gold Crivelli stations with bezel-set champagne diamonds.